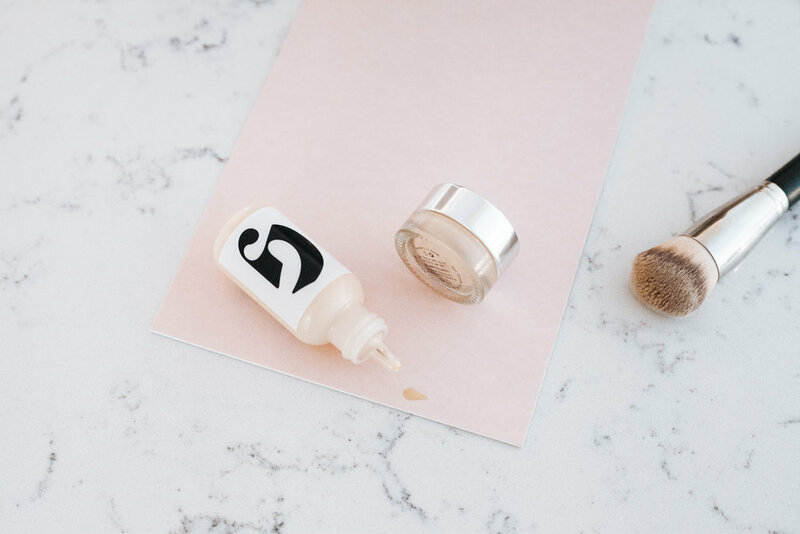 A couple weeks ago I ordered these two products from Glossier – The Stretch Concealer & the Perfecting Skin Tint, I had a lot of gals on Instagram ask me to keep them updated on what I thought of the products, so here is what I think…. I love the concealer, It does exactly as promised. The idea for this concealer is that it stretches with your face avoiding the classic cracked concealer look. I went with light because I wanted to use it to brighten my under eyes (which 3 babies in 3 years have turned completely purple), but medium would have probably also worked well with my skin tone. I also use it to even out the skin tone around my nose. This again is what it says it is. It’s not a foundation, and doesn’t give much coverage. It more just tints & evens skin tone. I use bronzer so I like to have something underneath for it to set into, this works for that. I think I’ll use it more in the warmer months when I’m tanned and don’t want much coverage. 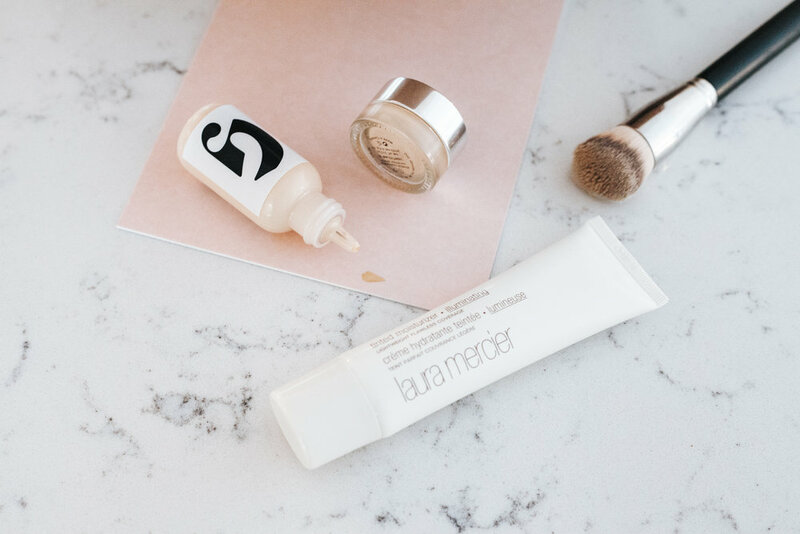 But for the winter months I have been mixing it with my favourite Laura Mercier Illuminating Tinted Moisturizer (in Natural Radiance) to give me that extra glow I “need”. Overall I would recommend the stretch concealer for sure, the skin tint I would recommend for light coverage only because it’s so natural and free of anything harmful to your skin. If it wasn’t for the health benefit I would put it much above any other skin tint. Also, the prices are great and obviously the packaging is too. Next up I will definitely try the Boy Brow (since I love brow gel & have heard great things) and the Soothing Face Mist, because I like to go heavy on the mist to set my make up & refresh it. Any products you’ve tried and loved (or hated)? *Unfortunately they don’t ship to Canada, surprise, surprise…. I live near the border so I’m able to order to my mailbox there. But hopefully they will soon! Previous Post and Skip makes 3. I’ve been using Mac Paint Pot in Painterly forevvvver as an under eye concealer. Do you like the stretch concealer better? I use the priming moisturizer and the boy brow in brown. I really like the moisturizer. Its light but effective (I have dry skin) and feels good on my skin. Not greasy at all. The boy brow is just okay in my opinion. Its a bit goopy so I have to clean off the wand like you would a mascara wand, before I apply. It doesn’t make your brows hard or stick down in place, but it does give nice color to help fill them in. I don’t think its any better than the Maybelline one. Looking forward to reading what you think about it! i have a bunch of glossier products and i think the one i use the most is the boy brow! I purchased their blush tints in beam and dusk and love them! I’m actually going to NYC this weekend and definitely picking up the boy brow gel and concealer. I love going lighter in the summer as well so the tint will definitely be on my list in the future!! I agree with your review. After using it for 6 months, I think it has improved my skin tone (a healthy glow) so the light coverage of the tint is actually ok.
And boy brow is a winner. I buy it two at a time so I’m never without. Looks crazy natural and no crunchy stiffness. How did you order Glossier to Canada? Canadian here who can’t seem to find Glossier international shipping and when I inquire they say they don’t ship to Canada? I live near the USA border, so I picked it up at a mailbox there.